I will be participating in the upcoming exhibition “Indiana Green” at the Frank Juarez Gallery. Frank Juarez Gallery is pleased to announce INDIANA GREEN 2013, a regional group show featuring a diverse body of work produced by artists living/working in Illinois and Wisconsin. This exhibition will showcase works ranging from photographs to installation, paintings to collage, figurative to abstraction and needlework to mixed media as a result of personal exploration of materials, media and ideas in a contemporary practice. 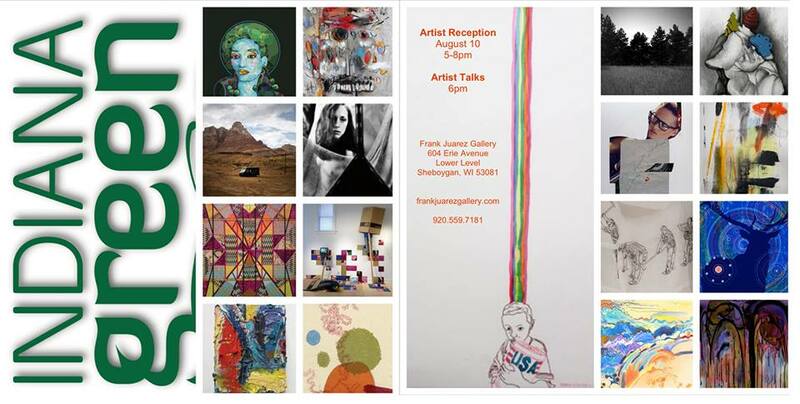 Join us for an artist reception on August 10 from 5 to 8pm with an artist talk at 6pm. The gallery is located at 604 Erie Avenue, Lower Level in Sheboygan. This exhibition runs from August 1 through September 7, 2013. Featured artists are Pamela Anderson (Wauwatosa), Andrea Avery (Sheboygan), Reginald Baylor (Milwaukee), Brandon Bauer (Fond du Lac), Tony Conrad (Appleton), Rose DiSalvo-Herzog (Chicago), L J Douglas (Bloomington), Daniel Fleming (Milwaukee), Jon Horvath (Waukesha), Kay Jelinek (Sheboygan), John Kowalczyk (Milwaukee), Sara Risley (Wauwatosa), Darrell Roberts (Chicago), Rafael Francisco Salas (Ripon), Jessica Z Schafer (Milwaukee), Dean Valadez (Milwaukee), and William Zuback (West Allis). Also on view is a large-scale painting titled, “Jenni with an ‘i’ by Dale Knaak. Next A Call To Halt – Opening Soon!